Julep — Maven Boxes (July–September 2017) & Gobs More! OK, so this is something of a haulage megapost, because I slacked all summer and only posted the unboxing of my first Julep Maven Box. Now, not only do I have my Maven Boxes for July, August, and September for you (note that I didn’t skip any months even though Julep gives you the option to do so as much as you’d like), but I also have mini hauls that I got in-between boxes. Julep is constantly running little deals that are so hard for me to resist, particularly since shipping is always free. And, it’s not just the free shipping. My Julep orders arrive so, so fast, and I’m in Canada! It’s amazing. I literally got my most recent order in two days. There’s never a customs charge, either (though I have never placed an order over US$33). In addition, their boxes come so neatly packed and easy to open. You just snip the little bit of strapping tape on the front and it opens up with no hassle. 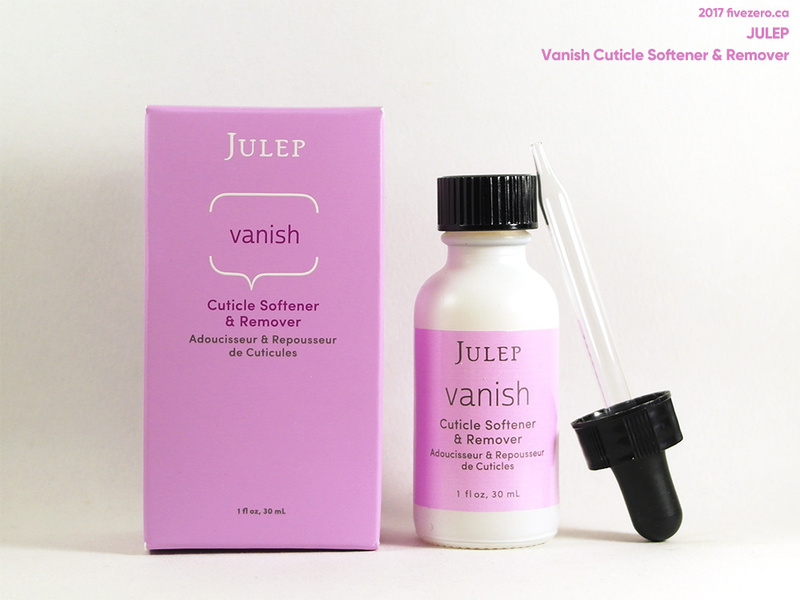 I’m super happy with Julep after four boxes, and I’ll definitely be resubscribing after my six-month subscription comes to an end. 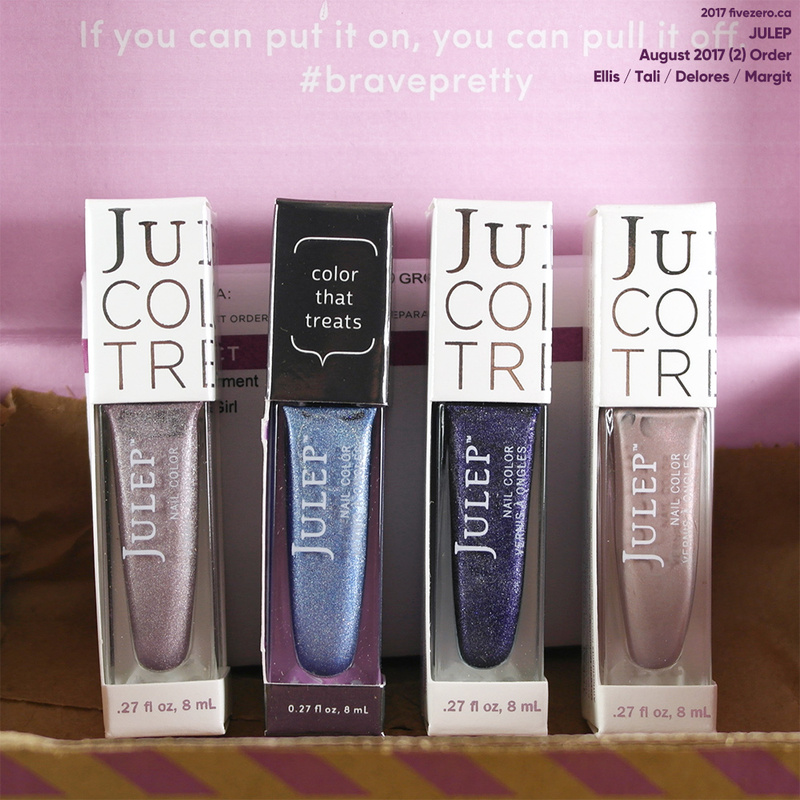 I think I should have enough Julep points (“Jules”) by then to get a free Maven Box, too. I posted my first Julep swatch last Friday (hint: it’s a purty one), and you can look forward to many more! Without further ado, here is my Julep summer haulage. It’s a biggie. 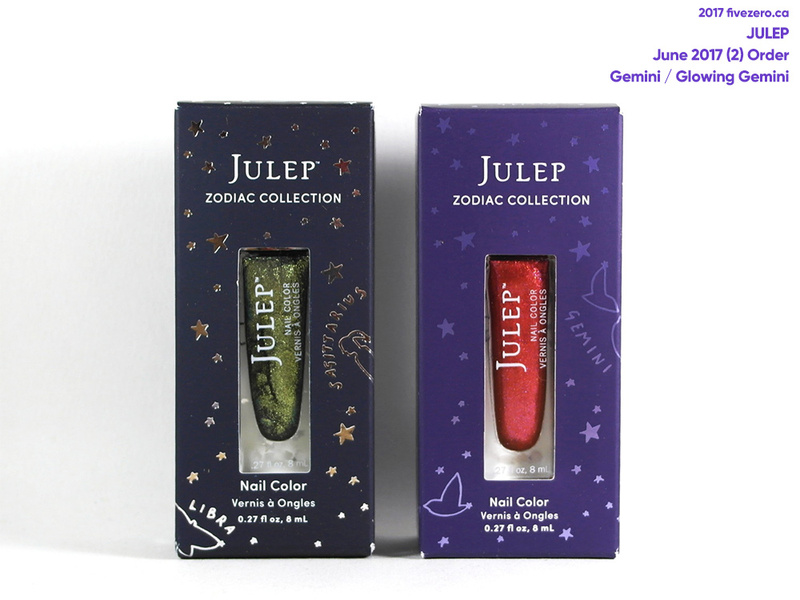 Julep ran a BOGO sale right after I got my first Maven Box, so I picked up two of the Zodiac polishes, twin polishes Gemini and Glowing Gemini! Baby Olive is a Gemini, though these are pretty polishes in their own right, and I’d have picked them up, anyway. Every month when you select products for your Maven Box, you’re given a limited (but still pretty good) selection to choose from. 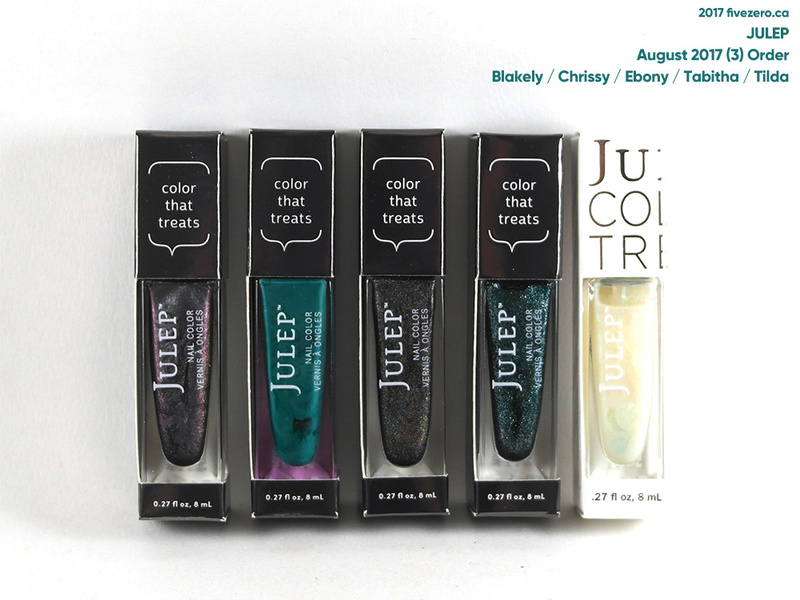 If there are specific items or polish shades you’re looking for, you may have to wait a while—otherwise, Julep’s sales are the best time to pick them up. I didn’t pick any nail polishes in my July Maven Box, but I did add-on three polishes to my order, at $4.99 each. Signe is from last month’s collection, where it was valued at $6.99 as a new shade; it’s a $4.99 add-on in the next month! Sam is from this month, but it’s a re-release (“from the vault”, as Julep like to say) and valued at $4.99 instead of $6.99. The free shade I received is Alysha, a beautiful one but it was included in my 12-polish welcome box! I’ll save it for a giveaway or something. I also got a free sheet of nail decals in my box. 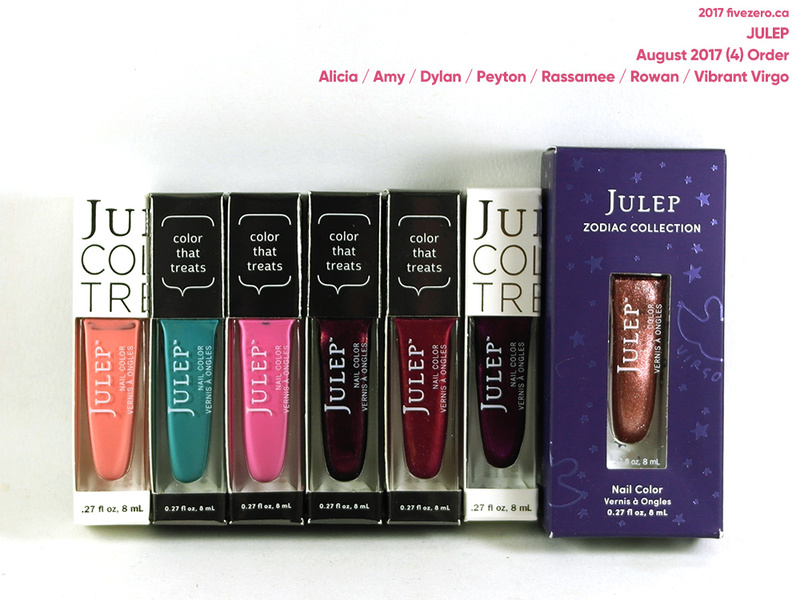 Julep throws in a freebie now and then—I don’t use nail decals, so this will go into my giveaway box, as well. Julep’s skincare products tend to be Korean beauty-inspired. This cleansing oil reminds me a lot of Josie Maran’s Argan Cleansing Oil; it works nicely, though I’m not 100% sure my skin is happy with it. I’ll do a full review, once I figure this out. 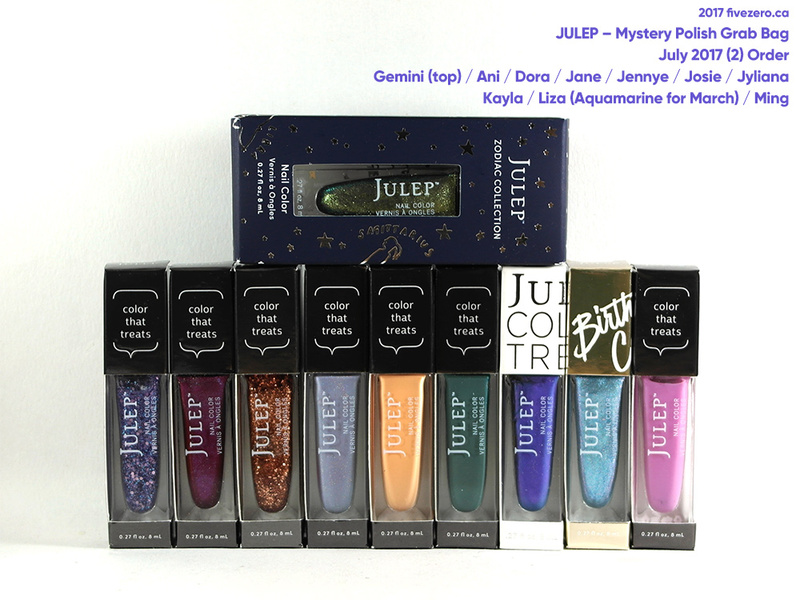 Julep occasionally releases Mystery Boxes and this was the first one I tried. It was strictly for polish: $20 for 10 shades. I ended up getting a great variety of colors, with only one polish I already had (Gemini), so I think it worked out really well. As my Julep collection grows, however, I’ll be less likely to gamble on a Mystery Bag, unless I’m planning on giving away some polish. At the same time, I also picked up an eyeliner for half price. 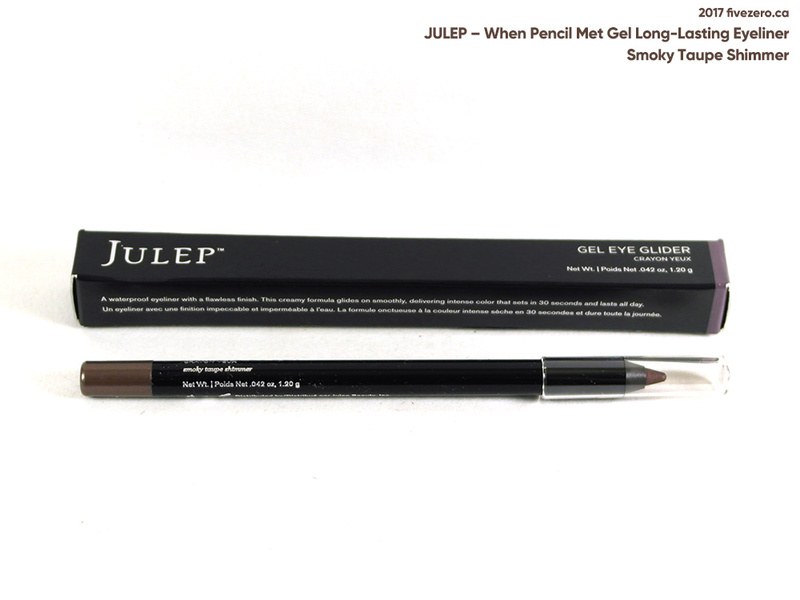 Julep’s When Pencil Met Gel Long-Lasting Eyeliner is often raved about, and I could never find the color I wanted (Smoky Taupe Shimmer) in the Maven Box selection—it’d either be absent or sold out instantly—so I used a Maven coupon to get it for $8 instead of $16. Usually when it shows up in the Maven Box selection or as an add-on, it goes for $6.99; if I like the formula, I’ll definitely pick up more fun shades at that lower price. I’m a Sagittarius, my husband is an Aquarius, Peanut is an Aries, and I already picked up Gemini and Glowing Gemini for Olive. No Pisces in my immediate family; just thought it looked nice! Got these half off, at $7 each. 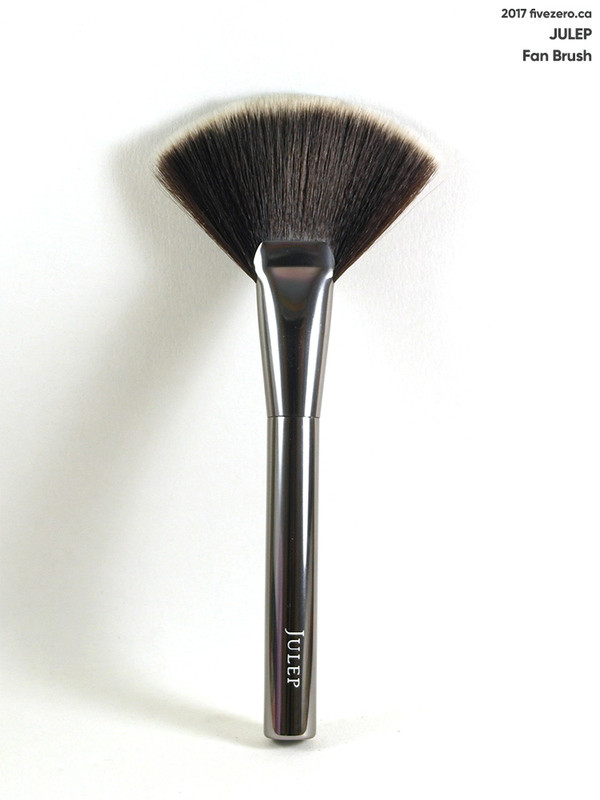 I liked my Bronzer Brush enough to also pick up the new Finishing Brush. 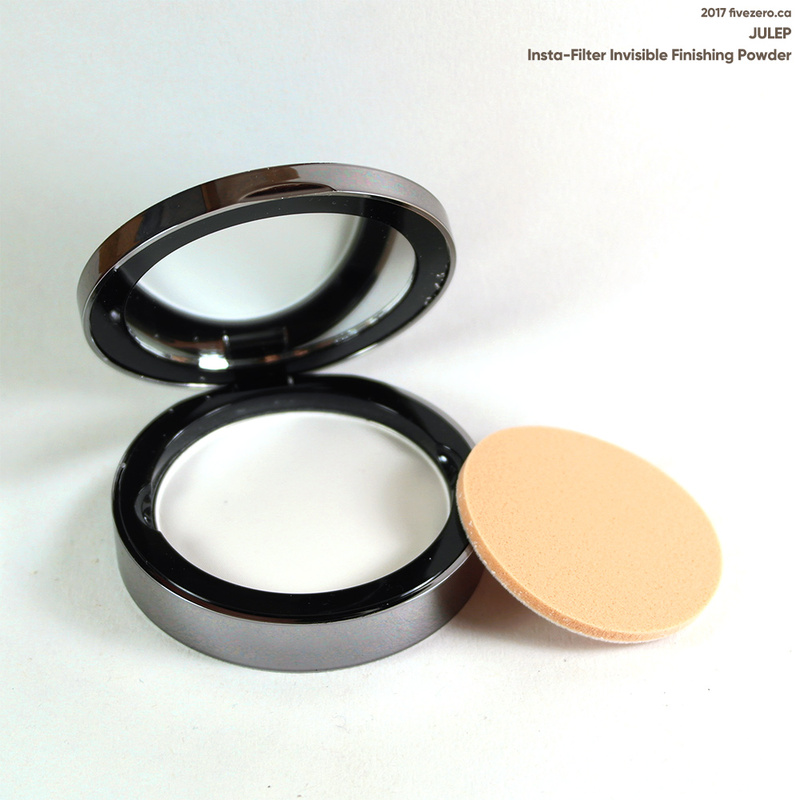 I always use setting powder, so this will get a lot of use. 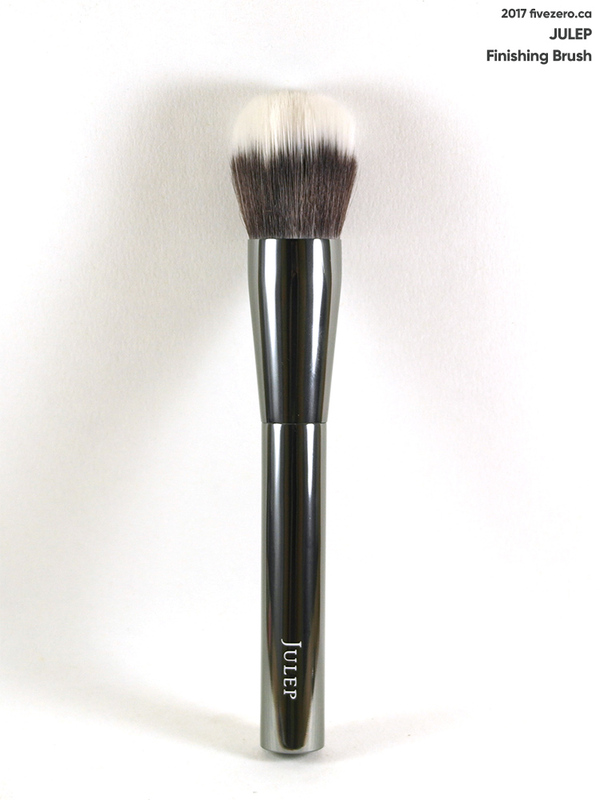 It may be time for me to retire my trusty (very, very) old Club Monaco powder brush! I could not resist picking up three more polishes as add-ons, and got Ange, a moody sea blue, as a freebie. Nice! 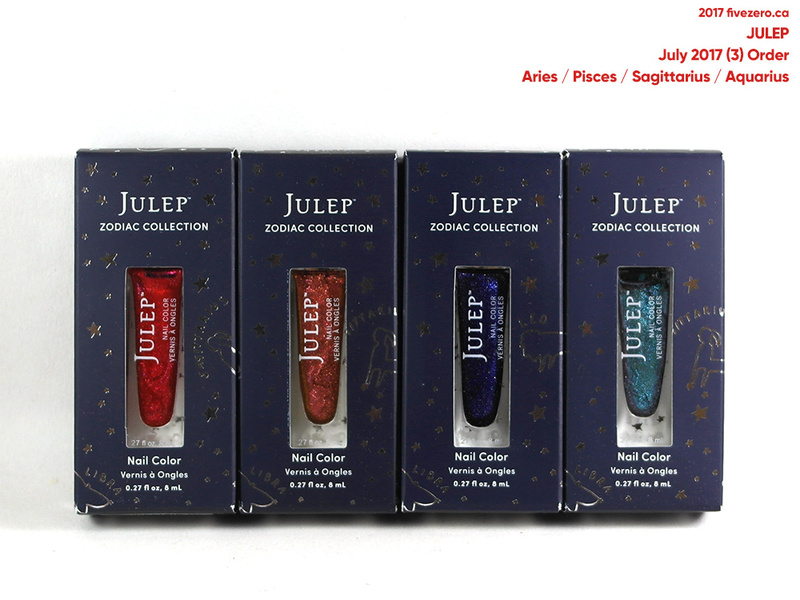 Julep is always putting out nail polish sets which can give you a pretty nice discount, if you like all the colors in a set. Here, I picked up a trio (Delores, Ellis, Tali) for $14 and added on Margit for $4.99. This is another set. I got a quad (Blakely, Ebony, Tabitha, Tilda) for $14 and added on Chrissy (close enough to my name, all right!) for $4.99. The set was inspired by August’s total solar eclipse. More sets. The just-released Vibrant Virgo was inexplicably not available for the August Maven Box (you could only add it on for $11.20), so I waited. Later in the month, it popped up in the Secret Store for a fabulous price: “The Gleam Team” duo (Vibrant Virgo, Peyton) for $9.99. I also picked up an “80 Degrees & Palm Trees” trio (Alicia, Amy, Dylan) for $12.99, and added on Rassamee and Rowan for $4.99 each. For this month’s box, I picked the Fan Brush, the Vanish Cuticle Softener & Remover, and a new Nail Color in Hana. Again, I chose three add-ons (Evan, Gladys, Kaitlyn) and got Katya, a vampy berry, as a freebie. 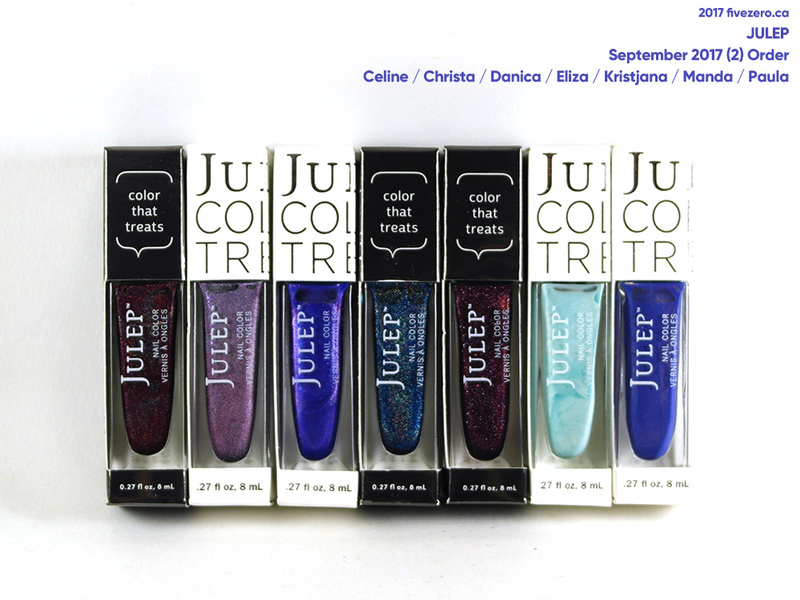 Julep ran a one-day sale on September 5: all polishes were $5 each! Ahhhhhhh! As I said before, you only get a selection of shades to choose from in your Maven Box each month, so there were a lot of shades I wanted but never had the chance to get at a discount. I picked up quite a few…and for some reason, some shades were listed at $4 instead of $5, so I got the lot for $31. What an amazing deal with that Mystery Box – $20 for 10 shades or awesome quality polish? Yes, please! 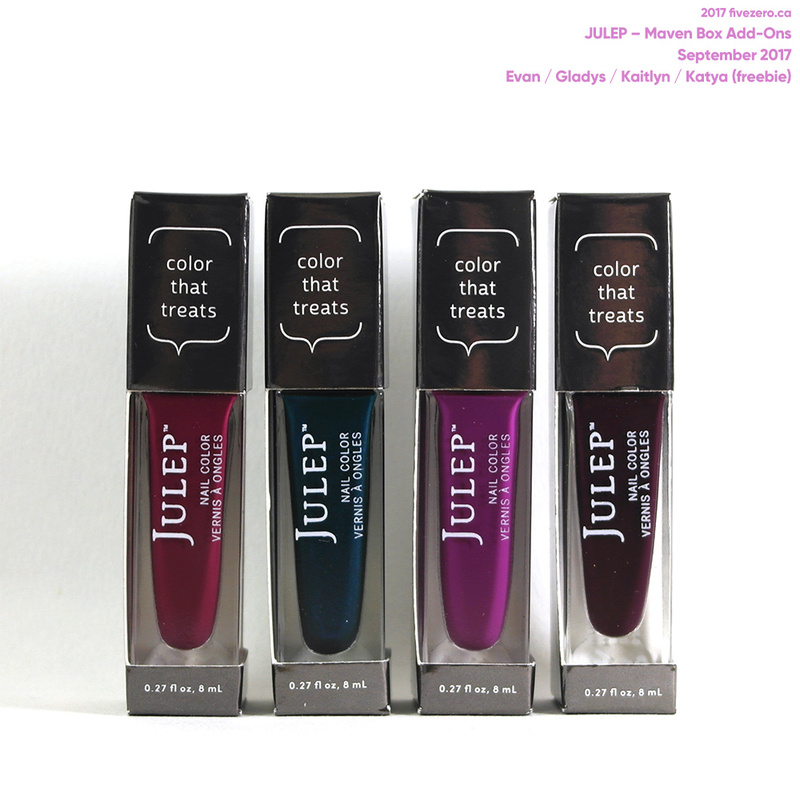 I vow to get my hands on some Julep before the end of the year! Not sure if I should succumb to a Maven box or just do a la carte. Weeell the next time there’s a good sale, I can give you the heads up and pass an order on to you, if it’s more convenient that way. 😆 LOL! Forgot to add I’m not sure if some of their deals are only valid for subscribers. OMG what a haul! 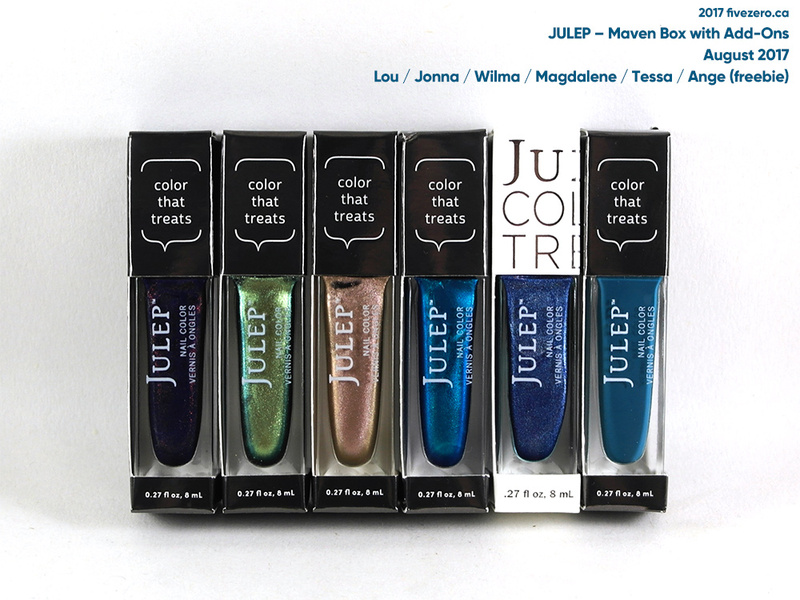 You’re sending me back 5-6 years, I used to be subscribed to Julep Maven but my polish collection started getting out of control so I cancelled it. I love that you can include non-nail polish items now – they’ve expanded their line a lot since I was subscribed!